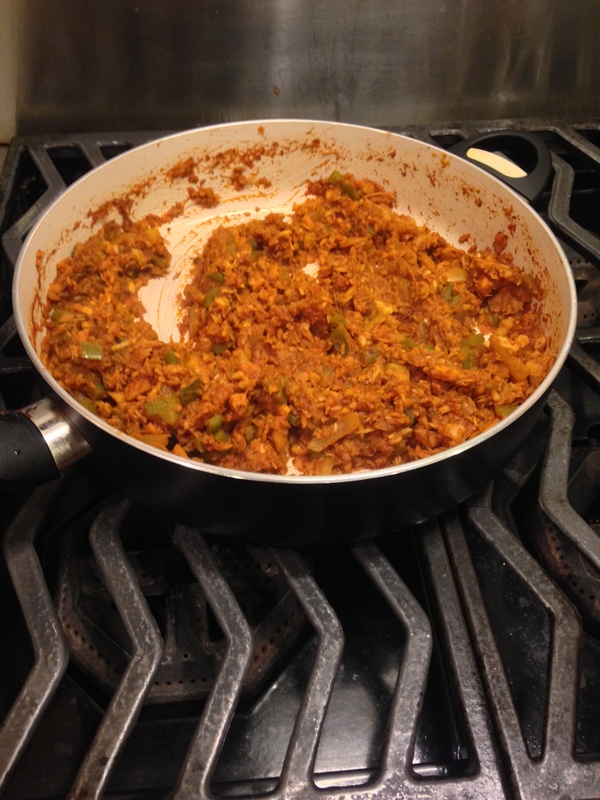 Jackfruit Sloppy Joe Recipe, slop slop sloppy joes! Before I get to the recipe I have a funny story to share. First of all, I don’t think my mother would have ever made sloppy joe’s for my brother and I to eat if it weren’t for my dad’s apparent love for musical comedy CDs. My dad is famous in our family for several things. For awhile, it was always needing the newest technology to play music or movies with. He had cd players in his cars pretty early on. The other thing he was famous, but still continues to this day, is the sick joy he gets out of torturing his family with the way he listens to music when we are in the car with him. He will make a point to have a bunch of music queued up, and will play the first 30 seconds of each song, until he finds the most annoying song he has, and then listens to that one in its entirety. Anyways, some time during my childhood, there was the song that all I remember from it was the chorus of “Sloppy Joe, slop sloppy Joe, yeah.” Except, until now, I had somehow thought that this song was either a Meatloaf song or some other classic rock group’s song (as those are probably my Dad’s other favorite types of Musicians). I don’t even know why, it’s obvious that this song was not meant to be serious. After researching for more details of the “Sloppy Joe song slop sloppy joe” (yes that’s what I googled) it was on an Adam Sandler CD. Apparently I was only 9 at the time when this song came out, and I don’t remember any of the other songs on this album. Up until now I hadn’t even realized it was an Adam Sandler song, even though I know all of the lyrics to the Chanukkah songs by heart. So, as I realized that there did not yet exist a vegan sloppy joe recipe that’s main ingredient was jackfruit, this song popped back into my head and I made it up. The jackfruit ends up complementing the other flavors very well, because jackfruit is a bit tangy, and with the seasonings and sauce almost makes it taste like there are pickles in the recipe. To me it tastes kind of like a fake cheeseburger with no burger or cheese. Heat oil on medium heat in a large frying pan with cover. Add in the onions, allow to cook until translucent. Add in the pepper and garlic and cook until the pepper turns bright green and then softens. Stir in the jackfruit and allow to cook for a few minutes. Stir for a bit, place the cover on top for a minute or two, and then take off the cover and stir a bit more. When the jackfruit has heated, reduce the heat to low and add the chili sauce, sugar, seasonings, and worcestershire sauce and stir until combined. 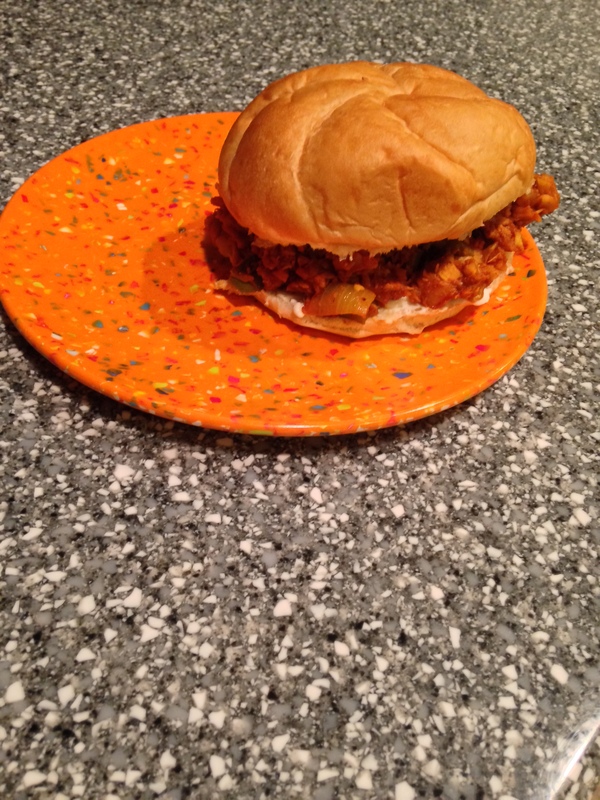 Spread Vegenaise onto the bun and put a generous amount of the sloppy joe mixture onto the bun. Try not to make too much of a mess of yourself while eating it.